The trio established that between 1985 and 2008, global increases in wave height were most significant for extreme waves – large spontaneous waves. They increased in height by an average of 7 per cent in the past 20 years. In equatorial regions the rise was 0.25 per cent a year, while in higher latitudes the rise was up to 1 per cent a year. The mean wave height also increased, but to a lesser degree. When analysing extreme wind speed data over the world’s oceans, the researchers found they increased by 10 per cent in the past two decades, or by 0.5 per cent a year. Professor Babanin said waves were generated by wind. However, the data show the lift in wind speed was greater than wave height increase. He said he doubted the 23 years of data could be immediately used to forecast future wind and wave conditions. “These are the environmental properties which can be used as indicators for the climate behaviour along with the other properties, such as temperature and precipitation, and extrapolations have to be made with caution,” he said. Scientists believe they are one step closer to creating time travel. American physicists from Vanderbilt University believe they may be able to use the Large Hadron Collider, the world’s biggest atom smasher buried underground near Geneva, to send a type of matter called the Higgs singlet into the past. But they’re unsure if the Higgs singlet actually exists and whether the machine can produce it, according to a report by Live Science. The Higgs singlet is related to another hypothesised particle called the Higgs boson, dubbed “God’s particle” because it is associated with giving other particles mass, which the 27-kilometre long atom smasher may produce. If the Higgs boson is created, the Higgs singlet may also appear, scientists say. The Higgs singlet may be able to jump through space and time, travel through a hidden dimension, and then re-enter our dimension forwards or backwards in time, physicists Professor Thomas Weiler and graduate fellow Chui Man Ho believe. “One of the attractive things about this approach to time travel is that it avoids all the big paradoxes,” Professor Weiler said in a statement on research website arxiv.org. “Because time travel is limited to these special particles, it is not possible for a man to travel back in time and murder one of his parents before he himself is born, for example. The singlet, a highly technical term to describe the particle that doesn’t interact with matter in the usual way, and boson are both named after theoretical physicist Peter Higgs. The researcher’s study is based on M theory, or “the theory of everything”, which attempts to unite the cause of all matter. But it’s much too early to start thinking like Back to the Future’sMarty McFly. University of Sydney Associate Professor of Physics Kevin Varvell said the study was highly speculative, something the researchers themselves admit. “From my reading of the paper, these guys themselves aren’t going crazy over the idea of time travel,” Professor Varvell said. “They explicitly say we’re not talking about time travel for humans, they’re talking about potentially one might be able to send information through the production of these particles. “But they’re also saying that’s very, very highly speculative as well. He said it’s one of many ideas that proposes using the collider and it is serious scientific work. 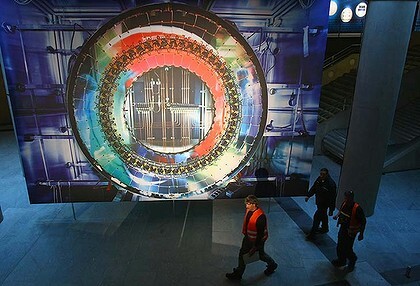 The Large Hadron Collider, which cost more than $4 billion to build, has attracted plenty of controversy. Before it started working, some feared it would create black holes and its operation was delayed several times due to a string of technical problems, including a liquid helium leak in 2008. The Transatlantic Seafloor Research Challenge is not a real competition, but that hasn’t stopped British designer Philip Pauley from envisioning it, and the watercraft that would take part in it. If it were to exist, the challenge would require underwater vehicles to cross from the UK to the US using whatever route their team members thought was the quickest, but they would have to stay in physical contact with the sea floor for as much of the distance as possible. Pauley’s Pathfinder submarines would be equipped with wheels or tracks for trundling along the bottom on most of the crossing, but would also theoretically be able to propel themselves up through the water when necessary. The designer estimates the trip taking between two and four weeks, during which time the submarines would maintain an average depth of at least 4,000 meters (2.5 miles). They would not be allowed to surface, but would instead be followed by topside support vessels that monitored their activities, and supplied life support and battery recharging power via umbilical cables. The support vessels would also be equipped with ROVs (underwater remote-operated vehicles), to assist the submarine crews in emergencies. The Pathfinders themselves would be 10 to 15 meters (33 to 49 feet) in length, and would support a three-person crew. A lithium battery system would provide power for the wheels/tracks, and for the two-to-four side thrusters and rear propeller. All waste generated by the crew would have to be contained within the vehicle. While the Transatlantic Challenge will presumably never happen, Pauley told us that he invented it as “a narrative to try to drive interest into the concept and engage investors.” Instead of winning races, he sees the subs being used more for scientific research and exploration. When we asked about possible positive buoyancy issues with all those big fat tires, he replied that his hope is that they would be semi-solid. He admitted, however, that the optional heavy tracks could pose a negative buoyancy problem, and were pictured mostly to grab the attention of potential military customers. The windows, he added, were just included for wider audience appeal, and would not be part of an actual Pathfinder. 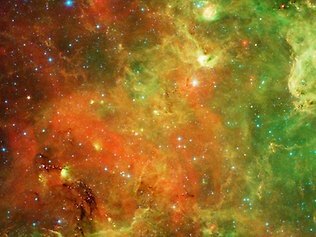 WE are not alone and alien life forms may have more in common with life on Earth than we had thought, according to a NASA scientist. The out-of-this-world research by Dr Richard B. Hoover, an astrobiologist with NASA’s Marshall Space Flight Centre, was published in the March edition of the Journal of Cosmology. In the report, Dr Hoover describes the latest findings in his study of an extremely rare class of meteorites, called CI1 carbonaceous chondrites – only nine such meteorites were known to exist on Earth. The scientist was convinced that his findings revealed fossil evidence of bacterial life within such meteorites and by extension, suggests we are not alone in the universe. “I interpret it as indicating that life is more broadly distributed than restricted strictly to the planet Earth,” Dr Hoover said. This field of study has just barely been touched because quite frankly, a great many scientists would say that this is impossible.”In what he called “a very simple process,” Dr Hoover fractured the meteorite stones under a sterile environment before examining the freshly broken surface with the standard tools of the scientist: a scanning electron microscope and a field emission electron scanning microscope, which allowed him to search the stone’s surface for evidence of fossil remains. He found the fossil remains of micro-organisms not so different from ordinary ones found underfoot on Earth. “The exciting thing is that they are in many cases recognisable and can be associated very closely with the generic species here on earth,” Dr Hoover said. Other scientists say the implications of this research were shocking, describing the findings variously as profound, very important and extraordinary. But Dr David Marais, an astrobiologist with NASA’s AMES Research Centre, said he was very cautious about jumping on the bandwagon. These kinds of claims have been made before, he noted and found to be false. “It’s an extraordinary claim, and thus I’ll need extraordinary evidence,” he said.